This is the part 2 of the 3-part series (part 1, part 3). 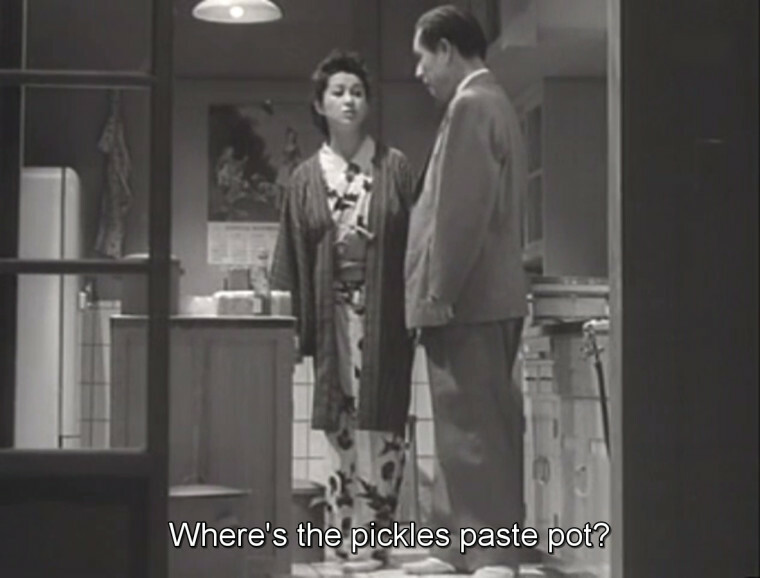 During the last sequence of Yasujiro Ozu’s “The Flavor of Green Tea Over Rice (お茶漬の味, 1952)”, Taeko (Michiyo Kogure) and Mokichi (Shin Saburi) have a late night meal of Ochazuke. 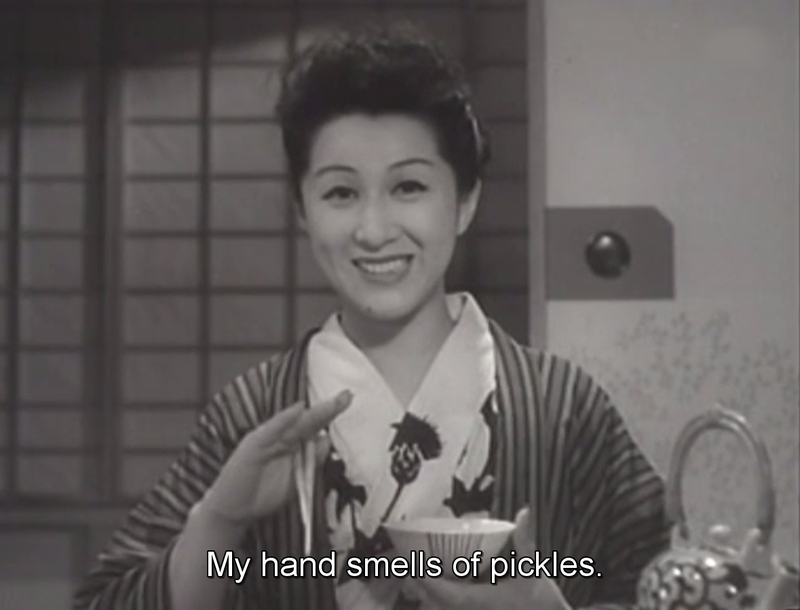 In English subtitles, Taeko notes, “My hand smells of pickles”, but she is actually saying, “My hand smells of nuka”. Nuka is a Japanese common name for rice bran, a common ingredient for fermenting bed for pickles. Rice bran and salt water (plus some other additives such as dried kelp ‘Konbu’ or red pepper) are brought together to make a paste. Various vegetables are immersed in this paste for some time (from one night to several weeks, depending on what kind of pickles you are preparing) and you have your own pickles. In the earlier scene, you can see her actually taking out some pickled vegetables from the nuka paste pot. The nuka paste is a fermenting bed, and it has a distinctive (read ‘awful’) odor. Rice, especially white rice is the most essential crop in Japanese agriculture, as you can imagine. It has been and still is the basis of our food culture. It is speculated that the rice cultivation was imported to Japan as early as 7th century B.C. and since then, the technology development of rice growing and harvesting, plus breed improvement to adapt to the climate have been the core of Japanese agriculture. Harvested rice undergoes various stages of preparation, and its last stage is polishing. Without polishing, a rice grain has a distinctive brown color. This is called genmai (brown rice). Then, various polishing techniques are used to remove bran from genmai, and you get white rice (polished rice). Rice bran, nuka, is a byproduct of white rice harvest. Instead of discarding this rather nutritious thin skin, people utilized it for various purposes, including for fermenting of vegetables to make pickles. Up until 1930’s, there was a widespread, deadly disease probably only observed in Japan. It is called beriberi in English and kakke (脚気) in Japanese. Today, we know it is vitamin B1 deficiency problem but before the discovery of the vitamin, Japanese medical academia was completely at loss as to what to do with it. One of the last Shogun of the Edo era, Iesada Tokugawa (1824 – 1858) died of the disease. Since Meiji Era (1868 – 1912), beriberi or kakke had became one of the most serious public health concerns, especially among the urban populations and particularly in military. Beriberi was called “Edo disease”, because it was widely known that a patient could easily recovered from the serious state of beriberi, if he/she relocated from Edo to a rural area. During Edo era (Samurai-feudal era), samurais and high-ranking officers in Edo/Tokyo were often victims of this disease. These ruling class consumed only polished rice, which resulted in Vitamin B1 deficient meal. In rural areas, people mostly consumed partially-polished rice or rice mixed with wheat or oats, which inadvertently supplied the vitamin. However, they didn’t know this mechanism and alluded the effect to water, air or psychological state. Later in the 19th century, the method of polishing rice had been improved, resulting in efficient production of affordable polished rice. This improvement caused increase in beriberi patients and victims. The Meiji Emperor suffered the disease repeatedly. Not only he himself suffered from the numbness in his feet, the typical symptom of the disease, but also he was concerned about the widespread of the disease in the Nation. Interestingly, many of his elite physicians didn’t have any means to suppress, let alone cure the illness, while some of the ‘town’ doctors with knowledge of folk remedies and Chinese medicines did cure the early-stage patients completely. The Emperor was increasingly frustrated with his elite and arrogant physicians. Kanehiro Takaki, the Imperial Navy physician trained in England, insisted the cause of beriberi must be some kind of nutrition deficiency in the meal. He had reasons to be interested in the disease: Japanese military, both Navy and Army, was experiencing devastating surge in number of beriberi patients and it was causing a huge setback in their military missions. Though Takaki initially thought it was protein deficiency, improvement in the meal did reduce the number of patients in the Navy vessels. Further, the Army did learn serving rice mixed with wheat almost wiped out the disease. However, Tadanao Ishiguro and Rintaro Mori, the top medical bureaucrats in the Army refused to accept the promising results, insisting “there is nothing logical about the process”. Rintaro Mori, the elite physician and public health policy officer, was trained in Germany and considered the brightest mind in the military. Excessively proud and arrogant, Mori considered the disease was caused by virus or bacteria. He laughed at the observation about dietary remedies and said “if wheat could heal the disease, so could horse urine.” It is true that the roles of these compounds now called vitamins were not discovered yet. He demanded the ‘logical’ explanation from the supporters of wheat diet, who couldn’t produce one at the time. So Mori, the higher ranking officer than any others, discredited the idea, effectively blocked the use of wheat in the Army. Here are the results. During the early decades of 20th century, there were many attempts to solve this public health problem, and successful ones all involved supplement of wheat or nuka. One of them was a medicine called ‘Anti-Beriberin’, which was the extract of nuka. ‘Anti-Beriberin’ was proved to be quite effective. 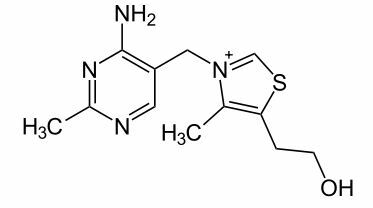 After the discovery of Vitamin B1 by Umetaro Suzuki (also from nuka) in 1910 and the death of Rintaro Mori in 1922, the correct countermeasure was taken to contain the disease. By the way, Rintaro Mori had another name. Ougai Mori, his pseudonym, is considered to be the giant of Japanese classic literature. For film fans, he is known for “Sansho Dayu”, the original novel for Kenji Mizoguchi’s masterpiece “Sansho the Baliff (山椒大夫, 1954)”.